Long before the blogosphere, long before Warseer, there was Portent and there was CARNAGE. What started as the first Portent tournaments quickly grew in reputation to become CARNAGE, representing all that was good and pure about a wargaming weekend away. This was in the days when Games Workshop's official Grand Tournament was the brutal blood bath that the regular tournament scene has since become. But back then a tournament wasn't about winning games. Oh no, it was about going out, having a good time with a big crowd of guys and getting absolutely wasted around Nottingham before staggering in (late!) for your first game on the following morning. Maybe your army list was thrown together that morning? More likely, your army was hastily built in the early hours of Saturday morning, having been up drinking all night. You were docked massive amounts of points for this, but nobody cared. Ah yes, such glorious days...which may yet come again. For CARNAGE has returned, bringing with it the sweet promise of drunken loutishness and playing Warhammer 40K quite simply for the love of playing Warhammer 40K. It's been years since the last CARNAGE tournament and I have countless fond memories from each and every one of them...which kind of blurr into one drunken, dice filled haze. The year I won 3rd place with my Deathwing. The year my Deathwing got ripped apart by Genestealers. 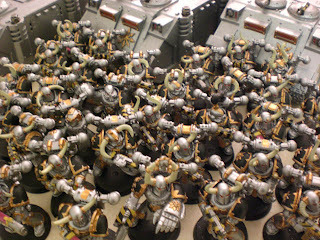 The year my Space Crusade Chaos Marines army kicked some serious arse. And of course, the year my Tau took a thrashing, only to come back in the following year and claw their way up into the top 10 with superior tactics. After all, that's what playing Tau is all about. Unfortunately, I don't expect my Tau hunter cadre to be ready by March, so it's up to those poor Iron Warriors to take up the slack and duke it out for a chance at ever lasting glory -or die a screaming death! Oh well, it is only a laugh. 40K 6th Edition - Ready Your Railguns! Warhammer 40K Good Value for Money?